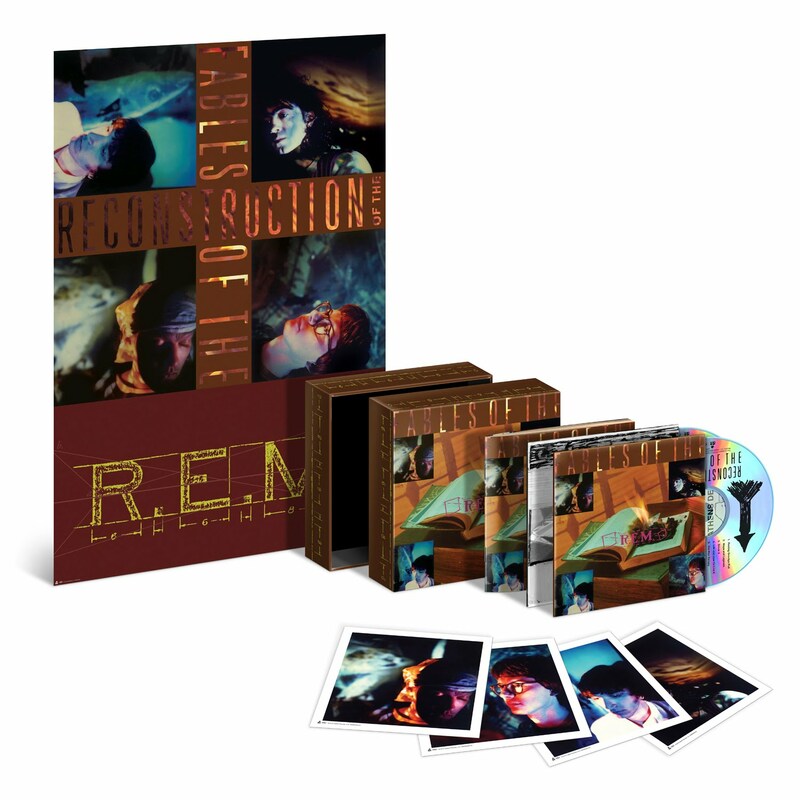 Discussions Magazine Music Blog: R.E.M./Fables Of The Reconstruction (25th Anniversary 2CD Edition): available July 13th, 2010! R.E.M./Fables Of The Reconstruction (25th Anniversary 2CD Edition): available July 13th, 2010! Hollywood, California –R.E.M. has teamed with Capitol/I.R.S. for the July 13 release of an expanded 25th Anniversary 2CD edition of the band’s 1985 album, Fables Of The Reconstruction. The new edition features the digitally remastered original album, plus 14 previously unreleased demo recordings, cut prior to the album’s studio sessions, including one long-sought track that has never been released. The commemorative release also adds insightful new liner notes by R.E.M. guitarist Peter Buck, with the 2CD package presented in a lift-top box with a poster and four postcards. On the same date, the remastered original album will be released on 180gm vinyl. Fables Of The Reconstruction, recorded during the winter of 1985 in London, England, distant in geography, weather and culture from R.E.M.’s Athens, Georgia home, represented a musical step forward for the band and its members, vocalist Michael Stipe, guitarist Peter Buck, bassist Mike Mills, and drummer Bill Berry. Produced by Joe Boyd (also known for his work with British folk and folk-rock musicians, including Nick Drake, Richard Thompson, and Fairport Convention), Fables marked the beginning of a more narrative, storytelling lyrical style in R.E.M.’s songwriting, with its songs spinning vivid tales of everyday life in the American South. Before going to London to record, R.E.M. huddled in Jim Hawkins’ Athens, Georgia studio for a few weeks, woodshedding and building new songs from fragments, including many which had emerged during soundchecks along the band’s 1984 tour. “The Athens Demos,” as R.E.M. has dubbed them, comprise the new edition’s second disc of 14 previously unreleased recordings, including drafts of Fables’ 11 songs and three additional tracks that didn’t make the album. The three non-album demos include two early versions of songs that were later revisited by the band and recorded for other releases and one song, “Throw Those Trolls Away,” making its release debut on this new edition. In the U.S., Fables Of The Reconstruction peaked at #28 on The Billboard 200, and its singles, “Can’t Get There From Here” and “Driver 8,” reached #14 and #22 on Billboard’s Mainstream Rock chart, respectively. In the U.K., Fables reached #35, the band’s highest U.K. chart position to that point in their career. Labels: Bill Berry, Capitol, Discussions Magazine, EMI, Fables Of The Reconstruction, IRS, Michael Stip, Mike Mills, Peter Buck, R.E.M.